Equipment: All equipment needed fort he duration of a tour is provided by us. Please bring: Bathing cloth, towel, stabil shoes that can get wet (just in case we don’t have your size). Contact lenses should be worn instead of glasses. Price: All prices are calculated on a group-size of min. 3 person. For less than 3 person please contact us. Medicine: Please inform us in advance about any diseases or limitations! 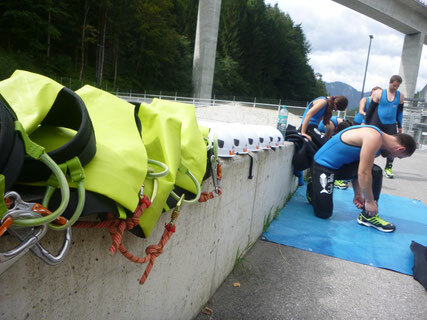 Canyoning urges absolut mental and physical fitness. Before and during the tour it is absolutly forbidden to consume alcohol or drugs! Meeting point: The individual meeting point is arranged personally. Please make sure to be on time! a tour must be shortened or even cancelled. This is only because of safety reasons.